It was my second rotation of the clinical year of PA school. I was excited to say the least. My preceptor was phenomenal and allowed me to be involved with each case. My first patient on this day was a 40-year-old male that had not been to the clinic for a year or so. The nurse rushed in and said, “guys, this guy does not look good, you need to come in right away.” My thoughts raced, and we quickly paced to the exam room. The first thing I recall when I saw the patient was that the nurse was correct, this guy was very sick. He was writhing with abdominal pain, and at first look, he was markedly yellow in appearance. I glanced at his vital signs and saw a blood pressure in the 90’s/60’s. At past office visits his pressure was always in the 130’s/80’s. In addition to the lower blood pressure he was febrile. I was thinking back through didactic year topics and realized this patient nearly meets all of the criteria for Reynold’s Pentad for ascending cholangitis. We stepped out of the room, and my preceptor asked what I wanted to do. Since we were in an outpatient clinic, I recommended sending him to the emergency department for further acute care and start of IV fluids and antibiotics. I responded with a CBC, CMP, including a bilirubin breakdown, urinalysis, GGT, PT/INR, PTT, blood cultures, CT of the abdomen, as well as starting antibiotic therapy once cultures were completed. We were able to follow up with our patient while he was in the ER. The abdominal CT scan revealed a gallstone completely obstructing the biliary tree. General surgery was consulted, and once the patient was stabilized the following day, an ERCP was completed with the removal of the gallstone and sphincterotomy. Thankfully, thus far into my practice, I have not seen another case of acute cholangitis, but this case gave me confidence and exposure to something I won’t routinely see in practice. 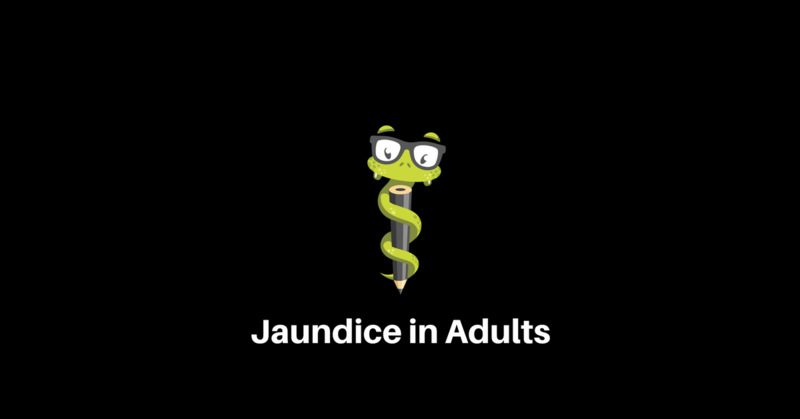 Today we will discuss the finding of jaundice in a patient and ways to adequately evaluate these patients. The workup of acute jaundice, just like with all patients and cases, should begin with a history and physical examination. Specific topics that should be addressed including alcohol and illicit drug abuse might point you towards an intrahepatic etiology. Other questions that should be asked is if there were any fever or viral symptoms that can occur with viral hepatitis, or fever with jaundice and abnormal vital signs, as with our patient, that might direct us towards cholangitis/sepsis. Painless jaundice with weight loss should pop up a red flag in your mind to assess for malignancy. 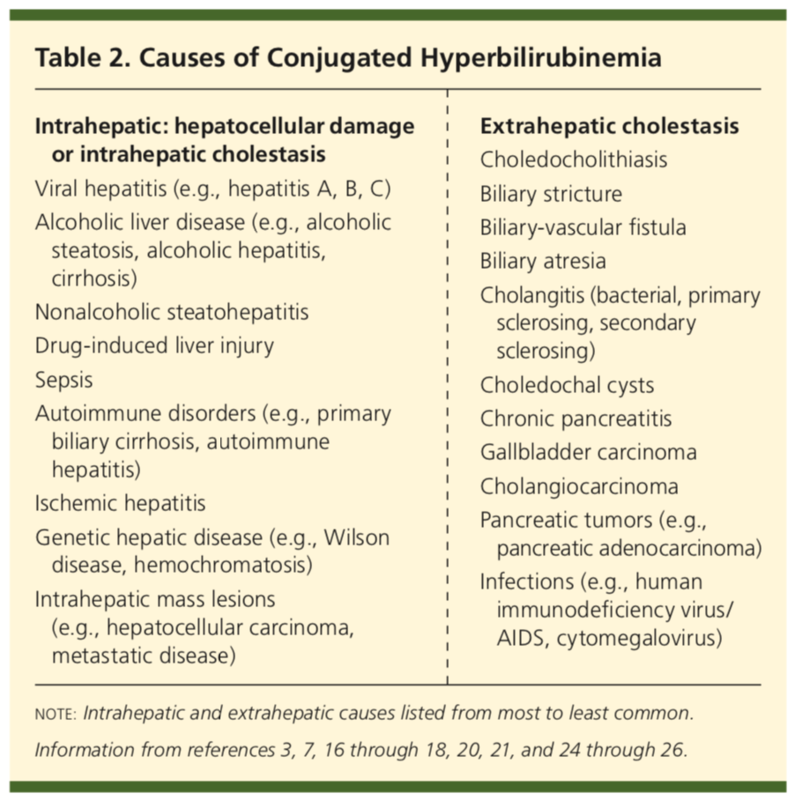 The fractionated bilirubin is essential to tell us if the elevated bilirubin is direct (conjugated) or indirect (unconjugated), which aids in finding the underlying etiology. 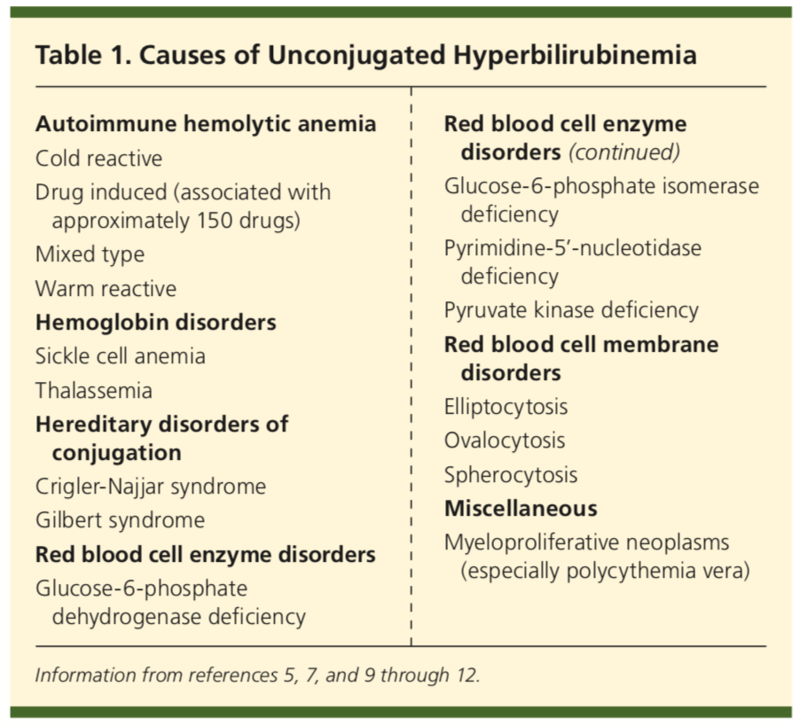 CBC with a smear assesses for any hemolysis which can be a cause of indirect hyperbilirubinemia. In addition, the CBC will evaluate for thrombocytopenia or anemia of chronic disease which can be seen in patients with chronic liver disease. ALT and AST are markers that if elevated are consistent with liver injury. However, if a patient has chronic liver disease, such as cirrhosis, these levels can be normal if there are not enough healthy liver cells to release these enzymes. ALP can be elevated in liver disease or biliary obstruction. However, elevated ALP is nonspecific for these two etiologies and can be raised with numerous other etiologies of the bone, kidney, placenta, or intestine. Regarding imaging, options include a RUQ ultrasound, CT of the abdomen, ERCP or MRCP. Ultrasound or CT are typically completed first to aid in assessing for liver and gallbladder pathology. Viewing of the biliary tree can be completed via MRCP or ERCP, where the ECRP allows for stent placement and can relieve obstruction if present. Lastly, endoscopic ultrasound can be completed along with the ERCP to assess for biliary tree blockage and can help determine if the problematic area is a stone versus mass. If the etiology is still unknown after laboratory and imaging evaluation, referral to GI should be considered for further assessment and possible liver biopsy. Lastly, something to always remember is if all of the laboratory tests and imaging are normal, but the patient appears jaundiced, assess for pseudojaundice. Chronic conditions such as anorexia and Addison disease, ingestion of foods heavy in beta-carotene, or use of spray tanning products can cause skin color changes that could be comparable to jaundice. As William of Ockham noted, when faced with a challenging obstacle, you should select the one that is the simplest or makes the fewest assumptions, known as Occam’s Razor. Try never to forget the most obvious. Perhaps the patient has been eating an absurd amount of carrots, kale, spinach, and sweet potatoes. Sometimes, the answer is looking you right in the face. 1) Am Fam Physician. 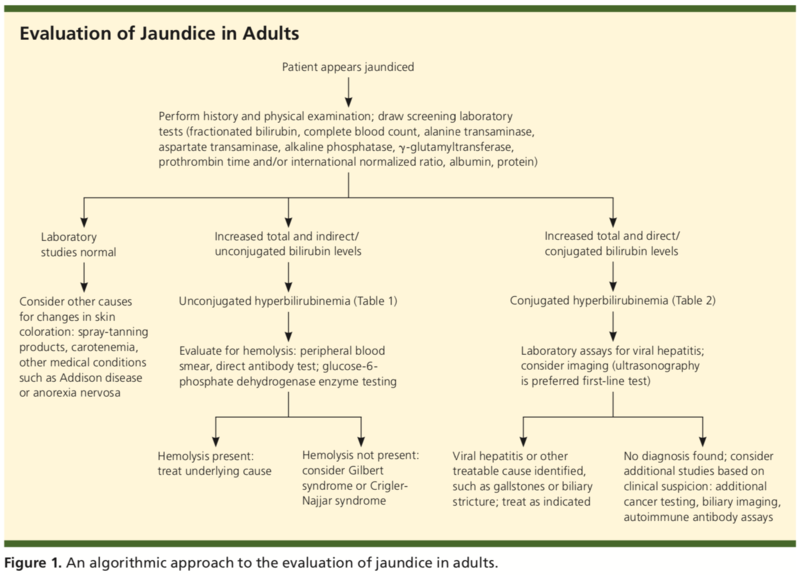 Evaluation of Jaundice in Adults. 2017;95(3):164-168. 2) Ferri’s Clinical Advisor. Jaundice. 2017. 3) Family Practice Notebook. Jaundice. Accessed: January 21, 2018. 4) Family Practice Notebook. Ascending Cholangitis. Accessed: January 21, 2018.